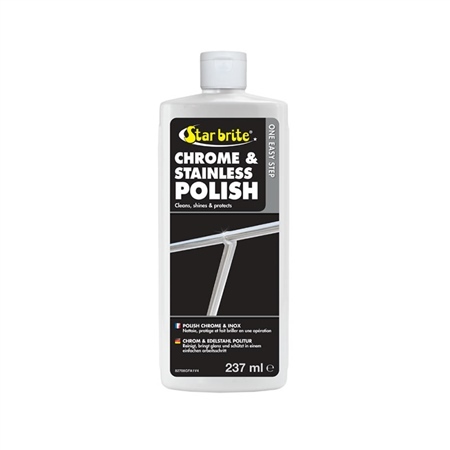 Starbrite Chrome & Stainless Polish helps keep both new and older boat metals looking their best by quickly and easily removing grit, grime and grease from metal surfaces. After a light buffing the formula leaves a protective barrier on metal surfaces to help prevent future pitting, salt deposits, and discoloration from rust and corrosion. •Cleans and shines all chrome and stainless steel surfaces in one easy step. •Protects against pitting, discoloration, staining and/or rusting. •Easy to use. Wipe on, wipe off formula. •Resists salt and water spray. •Bonds to metal for long lasting protection. •Also good for copper, tin and brass. Directions for use Shake bottle well before using. Metal should be dry before polishing. Apply to a clean, dry cloth and rub on metal to remove surface rust, dirt and grime. Reapply to cloth as needed; product works while moist. Star brite Chrome & Stainless Polish will quickly dry to a haze. Using a clean, dry cloth, wipe off haze to reveal polished surface. For best results, apply a second coat within 10 to 30 days. Two applications will provide a tough, durable shield against rust, surface corrosion, grease, grime and dirt. Contains Kerosene: Do not use or store near heat or flame. Size: 237ml / 8fl oz.